Spencer Providence, LLC is presenting a proposed development on Parcels 2 and 5 to the 195 Commission. The meeting was scheduled for this evening but has been postponed due to a posting error. Parcel 5 is located on the east bank of the Providence River bounded by Wickenden, South Main, South Water, and Dollar Streets. The proposal calls for a 2-story mixed-use building fronting Wickenden Street and a second 4-story building with a restaurant and 130-room hotel along the end of the parcel at Dollar Street. The whole parcel would have underground parking with 188 parking spaces. Parcel 2 is located north of Parcel 5 on the east bank of the Providence River bounded by South Main, South Water, Dollar, and James Streets. 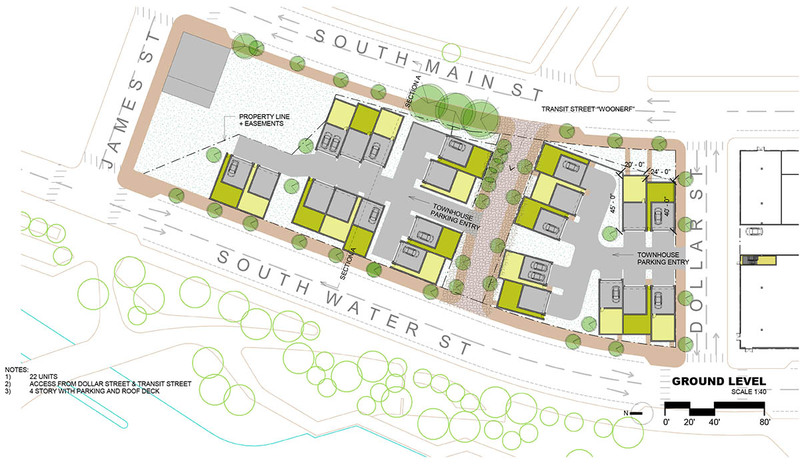 Nine rowhouse style buildings, 3-stories tall, with a total of 22 units would be built on the parcel. The rowhouses would feature ground level garages with driveways off Dollar Street and a new extension of Transit Street through the parcel. In the image above, I’m assuming the center buildings are the proposed hotel, which looks quite handsome. 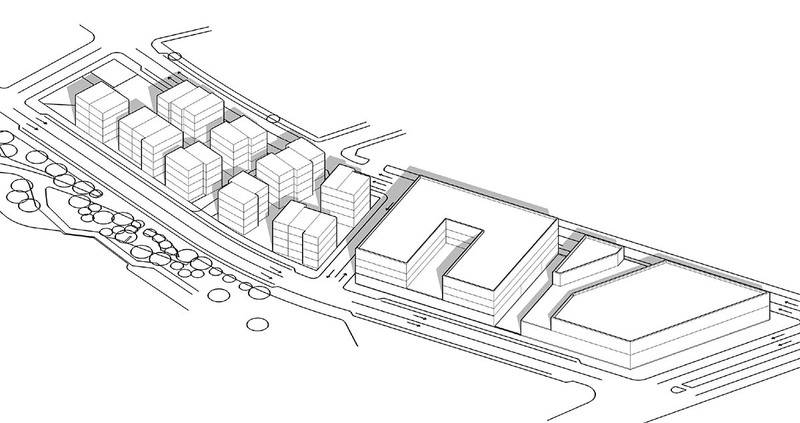 The site plan for the rowhouses is a total non-starter for me though. That is extremely suburban, does not belong in the center of the city. First time commenter here. Not an urban planning expert by any means, just someone who loves this city and loves watching it develop. I do like the parcel 5 part of this proposal, but find the parcel 2 site plan very disappointing (although I like the idea of extending Transit St). The floor plan for the specialty retail shows cart storage and oversized elevators. Perhaps they are planning a grocery store? The Jewelry District Association had presentations from Spencer Providence, LLC and Post Road Residential earlier this week, and Carpionato Group in February. After reviewing all the proposals, the JDA voted on them. Their choice was this one by Spencer Providence, LLC. 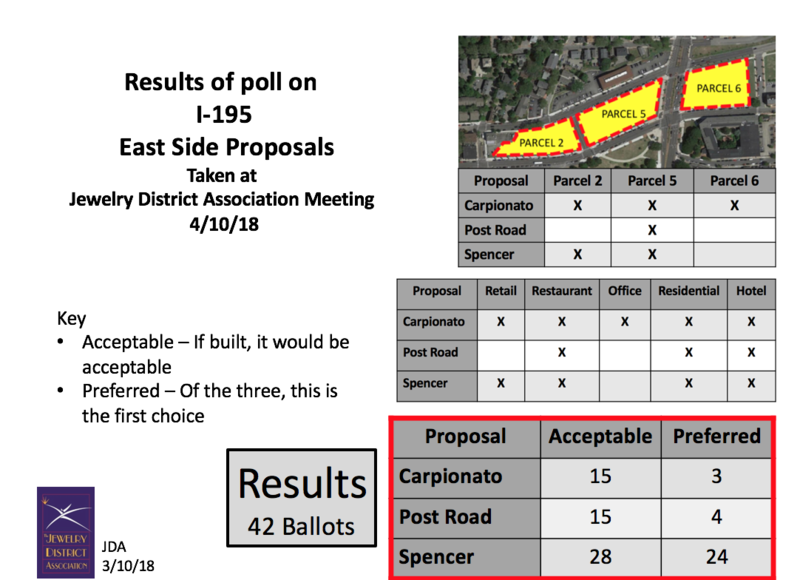 It’s really sad that among the respondents, the Post Road proposal scored essentially the same as the Carpionato proposal. I was at the JDA meeting and when the Spencer team said ‘grocery store’ there was a collective gasp of joy from the crowd, so I’m pretty sure that is what everyone is focused on. The JDA just wants suburban-type development. This Spencer proposal is literally the last thing that I would like to see on that land. Above ground parking next to the townhouse? I get it, the rendering is pretty, the use of the sidewalk, the textures, etc. However, the other two proposals would be better starting points. There must be density or don’t build anything at all (until a developer is ready to put forth an acceptable proposal). Providence, the city that turns down 33-55 story high rises, but welcomes 22 unit townhouse developments on prime riverfront land. Idiocy in its grandest form. I’m pretty OK with Spencer’s plans for Parcel 5 (the one fronting Wickenden). The building on Wickenden could be a little taller, maybe a floor or two of apartments. The rendering of the hotel building is quite nice. The rowhouses and driveways on Parcel 2 are a non-starter for me. I don’t think they conform with zoning either. It might only be a downtown zone thing, but downtown buildings have to be built to the street edge. I’d be fine with a row of houses built to the street on the South Main and South Water sides, and if they want, they could have a service alley down the center to allow for their parking. The service alley should be gated so it is not viewed from Dollar Street. Of the three (with only two rendered), I think I like the design of this one better. 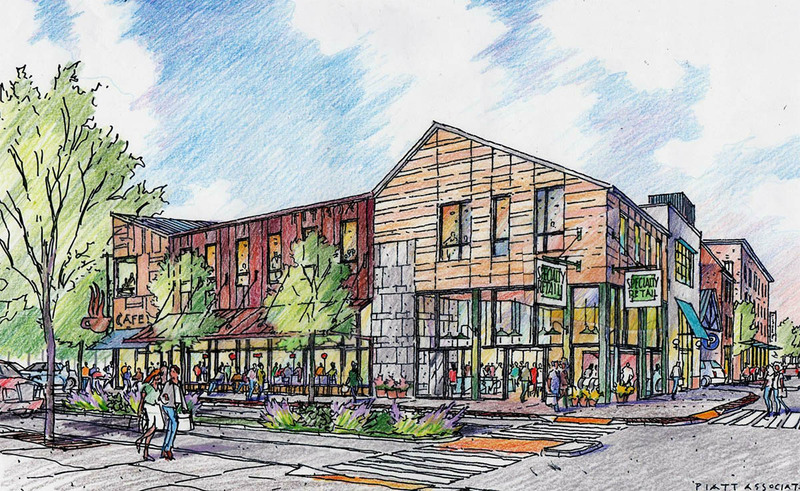 The potential of a grocery store is exciting for this part of the city. Yea I agree. this is too close to downtown to have “Smithfield” type development. I like the carpionato rendering from previous posts., something with height and density. I think what I was complaining about with the Carpionato proposal, working too hard to throw too many things at the design to somehow make it look historic, but failing, the architect for this project (looking at the limited renderings) has solved. That hotel building (the last image in the post) looks like it has always been there. The retail building at the Wickenden end has more modern (and one might argue trendy) design details, but I like it. The face running up Wickenden actually looks like Wickenden, with a slightly modernist twist, but using materials that soften that. It is as if the architect actually visited the site before doing their drawings. At the JDA meeting, the architect from Piatt Associates presented the design and made it clear that they really had studied the neighborhood and desired to engage with the local urban and aesthetic patterns. The parcel 5 proposal lives up to that, but parcel 2 sure doesn’t. It way undershoots the potential for that parcel. I take pride in knowing that a few will remember these parcels once possessed something somewhat unique and iconic to Providence, and brought simple joy and delight. Of course I’m speaking to the sunflower field I’ve planted and managed the past three years, as a way to promote Urban Landscape as an essential part of the city’s infrastructure. I’m under know delusion that it would continue forever and by no means oppose a transformation of these parcels beyond sunflowers, but great cities have great parks, and waterfronts. The opening of the 195-land was an opportunity to begin to build a great urban green heart running through the city, and better connect to the bay. These ubiquitous proposals fail to even attempt to inspire. I might consider it a fault of the master plan and not the development proposals themselves. I should also point out why’ll other cities are frantically preparing and designing for resilient waterfront edges in areas prone to sea level rise and storm surges, Providence is pursuing skyscrapers, suburban townhomes, and hotels? I love the city and want to see the most innovative and smart ideas take shape.